A relatively new sport of special interest to seniors has made its way to South Florida and will be part of Cutler Bay’s Senior Games in March. 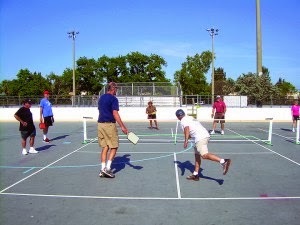 A Pickleball Demo/Clinic will take place on Saturday, Feb, 22, 8-10:30 a.m., on the multipurpose tennis courts at Saga Bay Park. A combination of three sports (tennis, ping pong and badminton), Pickleball is described as “the fastest growing adult sport in the country today” with more than 250,000 members so far and more each week. Mitchell Ball, who lives in the Hallandale/Hollywood area, is bringing the sport to Greater Miami for the first time. His enthusiasm for the game, already popular in other cities, led him to want to introduce it here.